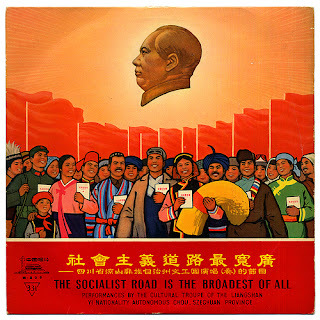 Song titles include: "Celebrating The Founding Of The Emancipated Serfs Association" — "The People's Communes Are Really Good" — "Carrying Manure Up The Mountainside" — "Young Intellectuals Come To The Home Of The Yi People"
"Carrying Manure Up The Mountainside", isn't that a song written by Dolly Parton? And haven't I heard "Young Intellectuals Come To The Home Of The Yi People"? Hm. Was it Beck's latest album? Or was it Momus 3:rd? I'm not sure. "7" and 10" EPs released by China Records between 1965 and 1978." It's a Bird! It's a Plane! It's Nabil Fawzi! Download another Percy Trout hour! "Hunting High ... ... and Low"
Download yet ANOTHER Percy Trout hour! The Guys Are Dead - Long Live The Mortal Trio! Do women and horror movies mix? Children of all ages! Listen up!